How much lighter and looser my muscles and joints have felt since training with bands. Lifting free weights in the form of barbells, machines that restrict range of motion (ROM) has an overuse wear/tear effect. Especially when performing repetitive joint movements. Consequently bands give us the option to train at horizontal vector set up positions. Thus, giving us a break from working against gravity and activating our joint stabilizers. Want to know the best part ? Subsequently, the pliability of the bands allow our joints/muscles to move freely through a ROM. Besides, the variable elastic resistance during repetitions give us the challenge that barbells, or machines won’t. Joints love resistance bands. 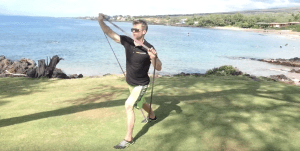 Ive listed 12 Resistance Bands Benefits here. Most common injuries gym members, sports specific athletes such as racquet sports players suffer include shoulder, or rotator cuff injuries. Generally these occur during end ROM movements. Incidentally, bands will create the opposite affect to dead weight training. Resistance bands have the advantage of an ascending resistance component, coupled with strengthening your joints at the end ROM. For example during a military press barbells weigh heavier in flexed position, then lighter at the fully extended end ROM. The band has the opposite affect. Strengthening the shoulder complex at its weakest, vulnerable point, namely the end/extended range should protect our shoulders from injury. This coupled with the fact resistance bands teach the body to decelerate during movements reduce ACL injuries in the form of preventing hyperextended knee joints. Moreover, when learning to decelerate this will subsequently activate the posterior kinetic chain, furthermore reducing injury. lastly, bands are great for stretching, another prevention reason to incorporate bands into your workouts. Recently i packed four bands in my luggage to visit home in Wales, while there i could train in the front room using bands, all the traditional exercises such as Deadlifts, squats, Rows, presses, was performed. In the meantime the bands weigh almost nothing and take up little space. Also, when I’m traveling and staying in hotels i always pack my bands, this means i can get a great workout done in small hotel rooms, i love this, particularly if theres no gym at the hotel, or I’m short on time. However, there are plenty of other places i take my bands such as, the local park, holidays, weekend trips, sports fields and courts, even to the gym itself. Bands offer the option to train all elements needed for successful fitness programs, compared to traditional equipment such as machines. I regularly train the modalities of strength, conditioning, speed, power, explosiveness, balance, agility, acceleration, deceleration, metabolic conditioning, mobility and flexibility. Elastic resistance is the next best tool available when using for injury rehabilitation together with injury prevention. Subsequently, using a single band, we’r able to perform traditional exercises like squats, rows,military press, arm curls etc. Its easy to couple traditional exercises with non traditional exercises like step up to press, resisted sprints/push ups and more. Super-bands or loop resistance bands can also be used to add tension to dead weights particularly barbells. Furthermore, bands are a fantastic addition to partner based drills, this adds lots of fun to any fitness regime. One element often overlooked when strength and conditioning is concerned, is the importance incorporating three dimensional movement patterns. Our bodies are able to move through a sagittal plane, frontal plane and transverse plane. Most programs only cover the sagittal plane – Covering the three planes of motion will defiantly benefit sports specific athletes, as most sports require our bodies, joints and muscles to move through all planes of motions. Another added benefit of training our joints through different angles and joint actions is that it decreases risks of injury. Our muscles and joints maintain their health working through different actions and movement patterns in comparison to a restricted/repetitive movements that may cause wear and tear to joints thus leading to overuse injury. 6 – Use Them Anywhere, Anyplace, Anytime. As discussed earlier, Bands are lightweight and highly portable. This allows us to take our resistance bands anywhere we go and basically use anytime. Particularly outdoor fresh air locations such as parks, beaches and indoor locations including the home and hotel room. 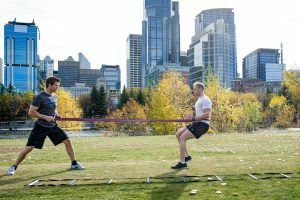 Moreover, resistance band training can be done out on the sports fields and courts, as well as being used in the gym weight room for added resistance, assistance, rehabbing a shoulder and used in a dynamic warm up/activation. Usually bands are popular outside of the weight room due to their portability and versatility compared to free weights. However, elastic resistance is becoming increasingly popular in gyms such as cross-fit studios, athletic development centres and regular gyms. The simple set up requires minimal effort thus gets you exercising in no time what so ever. The ascending resistance component in bands is thereby a unique benefit of using elastic resistance. in short, this means the resistance increases as you stretch the band further away from the point of attachment. Consequently this has the opposite affect on strength training in comparison to dead weight training I:e dumbbells/barbells. Dumbbells feel lighter on fully extended ROM during military presses, resistance bands increase with difficulty getting heavier when positioned at full ROM phases. Furthermore, this will train our shoulder joints to stabilize and increase in strength gains at full ROM positions. Its important to incorporate bands if using just free weights – Injuries generally occur when shoulder joints get locked out at full ROM under dead weight. The ascending elastic resistance activates joint stabilizers and strengthens potentially weak areas. Moreover, the ascending resistance consequently teaches our bodies to produce speed, power and explosiveness since the elastic resistance increases in difficulty as we push/pull/press/lunge/shuffle during an exercise or drill. Training with bands will increase and improve our abilities when having to accelerate and decelerate in every day life as well as boosting performance in a given sport. Lastly, the ascending resistance is a great way to challenge us and make gains to your balance and reactive core/trunk strength and activation. Bands are fantastic to incorporate in bootcamps due to their portability and versatility, they are very useful when it comes to working with specific populations such as seniors, youth and sports specific athletes. Elderly people have high rates of slips and falls that can have fatal consequences, as a rule when training seniors i take this factor into account. Incidentally, training with bands will activate the upright postural stabilizers, integrate our core stabilizers, help us react better to ground force reactions, enhance reactive movements to avoid falls. All of this will of course improves balance and functional core strength of elderly. From experience, my senior clients have made massive gains in all the elements mentioned above thus reducing the risks/rates in trips, slips and falls. Another population that would benefit massively from training with bands is namely youth sports athletes, these young competitors are still adapting and learning the qualities of movement patterns. Implementing elastic resistance to youth development will simply accelerate their abilities to load and explode, move their joints through a full range of motion more efficient, help connect the neuromuscular system with the working muscles. Youth athletes will understand and adapt to the components of acceleration and deceleration, becoming more familiar with centres of gravity over base of support. in tern avoiding injury. Lastly – Incorporating flat looped resistance bands to youth training is a natural progression to bodyweight training, this is recommended for youth fitness. One of the best ways to lose fat and gain muscle is to incorporate multi joints actions and compound movements into a program. If your goals are weight loss and or toning you could burn a load off calories, gain lean muscle by implementing multi joint, upper, lower and full body combination moves such as squat press, lunge press, deadlift row, push up tuck, squat pull, lunge pull, step up press etc. These types of activities increase your metabolic output and increase calorie expenditure. By the way, good research also indicates the above type workouts actually will promote calorie expenditure at a resting state, even when your not active. Reputable research often indicates we may subsequently burn more calories at a resting state as a result of these types of workouts in particular. One band will give you many options to perform multi joint exercises in define spaces such as a hotel room. As mentioned above theres many ways to integrate your whole body in one single movement. Thus maximizing your time and getting more out of your workouts. Generally, we train against gravity using dead weight resistance, a simple band set-up allows us to implement horizontal vector training . Thereby training in horizontal set ups would regularly activate and strengthen the kinetic chains, namely the lateral, anterior and posterior. These workouts integrate muscles with neuromuscular action forcing us to work as units burning more calories and gaining lean tissue consequently. Usually we will burn more calories standing than we would sitting, most horizontal resistance training is performed in a standing position. Horizontal resistance training gives us the option of training in unilateral and bilateral set ups. The unilateral approach will integrate more core stabilization as an example. Horizontal vector training coupled with vertical vector training is another option you could use just to add more variety, benefits and challenge. As well as resistance, bands get utilized for assistance against gravity. I regularly see gym members attaching bands to pull up bars in the gym, then performing some assisted pull ups. This may subsequently teach them to complete pull ups without the assistance of the band. Who needs expensive pull up machines that utilizes valuable space. When all you need is a single band that you could even carry in your pocket! Other ways of using bands to assist certain exercises are push up variations, step up variations, squat variations. If you need more – Any prone position set ups such as mountain climbers and crawls also work well. Just like i mentioned earlier, bands are joint friendly and incidentally fantastic for rehabbing injuries such as the shoulder joint. I have used bands rehabbing clients injuries and had plenty of success. For example, elastic resistance stretches and distracts Jammed joints. Resistance bands work wonders stretching and distracting Tight muscles around our joints, as well as the joints themselves. Particularly shoulders, hips and ankles are prime culprits for when it comes to “Locked” Joints, loop bands are a god send when unlocking Jammed joints. Bands are effective when activating and stabilizing muscles around the joints. i regularly introduce bands when clients are able to start resistance after injury. In conclusion – I’ve been using bands myself and with clients for years now, and I’ve experienced all results above. 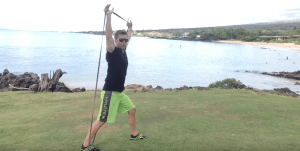 My clients have greatly benefited and gained newfound knowledge from training with resistance bands. now their addicted to band training and made smart investments off the link provided below.